Departing from the widespread use of the internet in modern society and the emerging use of web applications in healthcare this project captures persons’ needs and expectations in order to develop highly usable web recourses. The purpose of this paper is to outline a multi-case research project focused on the development and evaluation of person-centred web-based support for people with long-term illness. To support the underlying idea to move beyond the illness, we approach the development of web support from the perspective of the emergent area of person-centred care. The project aims to contribute to the ongoing development of web-based supports in health care and to the emerging field of person-centred care. The research design uses a meta-analytical approach through its focus on synthesizing experiences from four Swedish regional and national cases of design and use of web-based support in long-term illness. The cases include children (bladder dysfunction and urogenital malformation), young adults (living close to persons with mental illness), and two different cases of adults (women with breast cancer and childbearing women with type 1 diabetes). All of the cases are ongoing, though in different stages of design, implementation, and analysis. This, we argue, will lead to a synthesis of results on a meta-level not yet described. 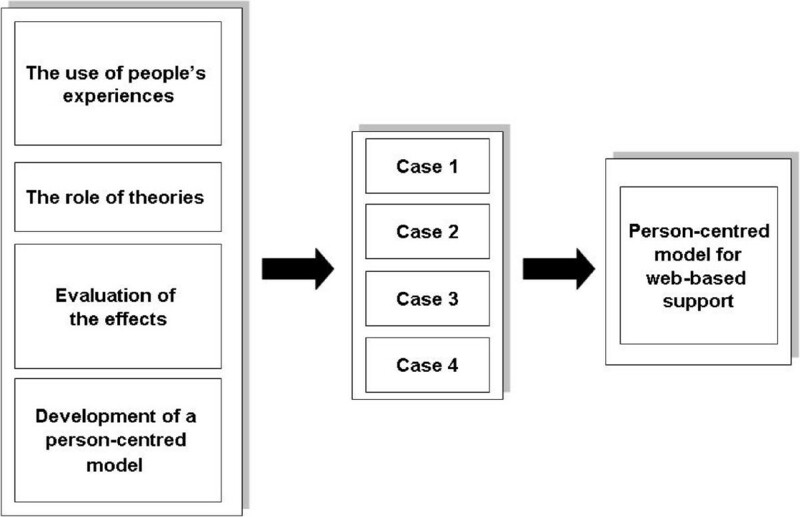 To allow valid comparisons between the four cases we explore and problematize them in relation to four main aspects: 1) The use of people’s experiences and needs; 2) The role of use of theories in the design of person-centred web-based supports; 3) The evaluation of the effects of health outcomes for the informants involved and 4) The development of a generic person-centred model for learning and social support for people with long-term illness and their significant others. Person-centred web-based support is a new area and few studies focus on how web-based interventions can contribute to the development of person-centred care. In summary, the main intention of the project outlined here is to contribute with both a synthesis of results on meta-level from four cases and a substantial contribution to the field person-centred care. This paper outlines a multi-case research project that aims to develop and evaluate a person-centred model of web-based learning and support for people with long-term illness. The aim of the paper is to introduce the conceptual and procedural components of an overarching project and its potential contributions. The intentions presented here will draw the attention towards the ongoing development of internet use in the realm of private life as well as in health care. Most people of all ages now have access to the Internet and to online alternatives for decision making. It is common to go online to seek not only information about medical or psychological treatments, but also help and support from people who are facing a similar situation (c.f)[1–4]. The Internet has also become an efficient alternative to traditional health care and treatment. There is scientific evidence for the benefits of some web-based therapies and computerized self-help treatments, including cognitive therapy for people with mood disorders, management strategies for patients with chronic disease (c.f)[6–8], and self-help for cancer patients. However, many of these studies focus on the results for only one diagnosis, while the project outlined here examines four different cases and includes a variety of diagnoses, symptoms, and ways of providing web-based support. This, we argue, will lead to a synthesis of results on a meta-level not previously described. Efficient web resources for people with illnesses must address their specific needs and experiences (c.f)[8, 10, 11]. To keep our focus on the person and on the idea of moving beyond the illness, we will approach the development of web support from the perspective of person-centred care (PCC). As a field, PCC is still under development, but studies have shown its positive outcomes for older people with long-term illness and their relatives[13, 14]. Due to its emerging status there is no consensus on an absolute definition of PCC; however, a review of the concept identified four major areas of research activity: (1) the extension of the scope of medicine from the purely biological to include psychological and social aspects; (2) the use of a 'patient-as-person’ view to understand the individual’s experience of illness; (3) the sharing of power and responsibility; and (4) the therapeutic alliance between the patient and the caregiver. PCC is thus characterized by its relational aspects, which make the patients’ experiences central. Patients’ interpretations of their illness and the surrounding circumstances will guide them in their recovery process, and thus the patients’ narratives are the starting point for PCC, built by a partnership between patients and their careers. This can lead to sharing of information, shared deliberation and shared decision-making in order to achieve commonly agreed goal[12, 16]. Person-centred web-based support is a new area and few studies focus on how web-based interventions can contribute to the further development of PCC. This means there is a gap in the knowledge as to which person-centred learning and social processes mediated via the web can best strengthen patients’ abilities to make decisions about self-care and treatment options. In summary, the main intention of the project outlined here is to contribute with both a synthesis of results on meta-level from four cases and a substantial contribution to the field person-centred. A person-centred approach to the development of web-based support is an endeavour towards understanding the complex range of individual needs and knowledge processes. At the same time it is concerned with creating resources for change on individual, social, and societal levels. To capture and analyse this complexity we need to complement our person-centred approach with relevant conceptual tools and background theories that support a broad and flexible understanding. Three conceptual sources constitute our theoretical basis and inform our understandings of the phenomenon of web support on different levels and the relationships between those levels. At the same time these sources guide our understanding of core activities (such as seeking information and social support, learning, and participating in online communities) involved in the use and development of web-based support to manage long-term illness. Our theoretical stance is based first, on the individual and social levels, on the ideas of social theory of learning as introduced by Wenger, who argues that social participation is a process of learning and knowing that includes the components of meaning, practice, community, and identity. Second, also on the individual and social levels, and related to the ideas of learning, we apply the concept of social support as vital to everyday life an important contributor to mental and physical health and well-being. House, Landis & Umberson defined social support as the interactive process in which emotional concern, instrumental aid, information, and appraisal are obtained from one’s social network. The most common types of support in online communities seem to be informational and emotional support[20, 21], which can offer stability and help members manage uncertainty while preserving their autonomy and integrity in social interactions. Third, the ecological model of systems theory[23, 24] serves as an overall theoretical structure that enables analysis and allows conclusions to be drawn from diverse interventional data in various contexts, and thereby increases understanding of the relationships within and between the different levels of change. The ecological model describes the interactions of systems in different settings, and it includes aspects of the environment that make it possible to take into consideration the multi-faceted nature of a person’s life course including such aspects as that person’s past and present, surroundings and social groups, and learning and development. The main levels of the system are the microsystem, mesosystem, exosystem, and macrosystem. These systems involve activities which interrelate both within themselves and with the other levels of systems[23, 24]. The study protocol, covering data from four different studies, was approved by the ethics committee of the: Case 1: Regional Ethical Review Board in Gothenburg (Dnr/550-10 and 652–12); Case 2: Regional Ethical Review Board in Gothenburg (Dnr/368-07); Case 3: Regional Ethical Review Board in Gothenburg (Dnr/659-09) and Clinical Trials Protocol ID NCTO01565824; Case 4: Regional Ethical Review Board in Gothenburg (Dnr/762-08) and Clinical Trials Protocol ID A2007003. All participants gave written informed consent for recording, analysis and publication of their data collected within this study. The research design uses a meta-analytical approach through its focus on synthesizing experiences from four Swedish regional and national cases of design and use of web-based support in long-term illness. The cases include children, young adults, and adults living with diagnoses such as bladder dysfunction and urogenital malformation, breast cancer, type 1 diabetes, and mental illness (Table 1). All of the cases are ongoing, though in different stages of design, implementation, and analysis. Pre-school children (aged 4–6) with bladder dysfunction and urogenital malformation. Women who have undergone surgery for breast cancer. Women with type 1 diabetes who are pregnant or in early motherhood (with an infant up to 6 months old). Young adults (aged 16–25) living with mental illness. To investigate how a web-based model for person-centred learning and support affects health and self-esteem. To investigate how an IT/web-based educational programme can support and affect health and well-being. To investigate whether and how web-based support during pregnancy and early motherhood can improve well-being and diabetes management. To develop and implement web-based support and treatment and investigate whether and how it can facilitate well-being. Web support with specially developed pictures and stories. Communication between children and a “web teacher” using Skype. CD and web support with information and expert lectures on different topics (medical, social, and psychological). Web support with information and a self-management tool for documentation and peer-support. Web support for learning, self-care, and peer and professional support. The intention is to pursue a synthesis on a meta-level of these cases to create a model for the design and use of an effective person-centred web-based support for people with long-term illness. In some of these cases it may be possible to repeat the interventions, thereby adding a longitudinal dimension to the research design. Our approach contains several interventions and uses both qualitative and quantitative methods of data generation and analysis. To allow valid comparisons between the four cases we intend to analyse and problematize them in relation to four main aspects (Figure 1): (1) the use of people’s experiences, (2) the role of theories, (3) the evaluation of the effects, and (4) the development of a person-centred model. The studied aspects of web support development. Our intention to contribute to the emerging field of PCC with web-based interventions based on people’s experiences motivates our focus on these four aspects; however, we acknowledge the need to analyse other aspects to make the picture of web-support development as complete as possible. Other aspects might include in-depth studies of design, different forms of technology, technology use, effects of web support for specific patient groups, and the larger role of web support in health care. Many patients have unique knowledge, based on their experiences of living with a disease for a long time. This knowledge is seldom used when decisions about patient care are taken, even though research indicates that shared decisions can help the patient to feel more in control and better satisfied, not only with the care, but with their whole attitude towards life. The PCC approach to the development of web support is still in its infancy, and if patients’ participation is overlooked, there is a risk of losing important end-user information in the design[26, 27], which could also jeopardize the efficient use of the support. A participatory approach to the development of web support is therefore important to both its development and eventual effectiveness. Efforts involve patients, their families, and their close friends to capture their experiences and needs when managing illness. Therefore, in the four cases within the research project we explore and analyse peoples’ needs, wishes, and expectations to create person-centred web-based supports for learning and interaction in different contexts. Data collection includes various techniques including focus groups, films, web-based surveys, Skype and qualitative interviews with prospective users. Also, the design and evaluation of technology for such supports and self-monitoring must consider users’ different degrees and qualities of assimilating and using the technology in its actual context[27, 28]. Hence, data is also gathered to identify the techniques used taken the variation of age, gender and diagnosis-related circumstances into account, and how and to what degree the web-based support is used. This means our work is characterized by an iterative design process, which includes phases of content specification followed by creative design tailored to the target audience, usability testing, and finally field testing. The design of computerized and other supports for patients is an important issue since it affects their capacities and roles. The design might be affected by how different groups of actors participate in and influence the design process[30–32]. The design is also affected by more theoretical types of input. In a review of studies of various aspects of patient-decision supports, Durand et al. conclude that not many of these (34%) consider the theories that informed the design or the evaluation. In a study of the design of web-based patient support, Elwyn et al. suggest a model of how to organize the design process, including participating actors and specific steps. In contrast, Ekberg et al. outline a model of the design of a web-based support explicitly aimed to be based on theories about learning and collaboration. However, neither of these studies applies a critical perspective to how theories are actually used in the design of web-based support or provide a summarizing perspective on theories and their different types and roles in the projects. With this as a background, in our project we will investigate the use of theories in the design of PCC web-based support in two parts. In the first part we will categorize the different types of theories apparent in our four cases and their roles in the overall design of the projects. A preliminary step in this part is to distinguish between the role of broad background theories such as the social theory of learning, social support, and the ecological model of systems theory, theories that actually serve as a basis for the design of certain parts of the technology such as Communities of Practice, and theories affecting the organization of the design project such as Participatory Design. An important result will also be the identification of actual instances of the theory types as they appear in the design of the web-based supports. The second part is to evaluate how the use of these types of theories in the four cases affect the web-based support in all of its aspects (e.g. design process, technology implementation, and health and other effects,) against the background of the PCC perspective. Our intention is to enhance the use of theories in the design of web-based support. In general, evaluation is recognised as crucial to the design of information technology (IT) solutions as it creates space and opportunities for analysis and continuous improvements. There are many different models for evaluation and they cover different aspects of the particular IT (e.g. use, technology, economy, outcome, etc.). In the four cases within this project the evaluation model is characterized by evaluation of web support in real settings. This means a focus on real users facing real problems as opposed to evaluations in abstract settings in which researchers analyse theory, realistic scenarios, and assumed benefits. Our evaluation concerns two main areas. First, it is concerned with personal benefits and health outcomes for the patients involved. This is an important aspect as PCC is based on a concern for individual needs and expectations. Since there are great variations in how people cope with illness it is important to understand who will benefit from using a web-based support and who might need other forms of support. Second, our evaluation focuses on how the benefits and health outcomes are actually created. This is important in order to form the basis to further develop and improve the web support in an iterativ design process. Additionally, the evaluation of the four cases will contribute to our efforts to introduce a person-centred model for the development of web-based support. Data for evaluation will be generated through the online and offline instruments used in the cases. These measure different outcome measures in the four cases, such as health, well-being, quality of life, anxiety and depression, coping, self-efficacy, self-management, and knowledge about the long-term illness. However, to generalize the effect according to health according to the individual person, we assume that the use of the outcome measures well-being and self-efficacy, capturing from all four cases, will mirror the individuals’ subjective feeling of actual health situation as well as the persons’ view on how to cope with the stress situation according to health. Data will be analysed using both within-case and across-case statistical analyses. Earlier work on the development of web support stresses the need for models that guide the design and adequately meet the needs of patients (c.f)[6, 8, 34]. However, most studies are based on single cases with a focus on only one disease or patient group. We acknowledge these as creditable contributions to a better understanding of the development of web supports, but they indicate a need for more generic approaches as well. Therefore, our multiple-case method, in which overlapping results from different contexts will provide comprehensive experiences, will contribute to the design of a more generally applicable, individually modifiable model. Furthermore, the research design, with four cases, allows a synthesis of the experiences of both sexes with a variety of diseases, ages, phases of life, and contexts. These varied experiences will contribute to a model usable in everyday life that will facilitate person-centred decision making by patients with long-term illness and their significant others. Our assumption is that the participatory approach will promote a person-centred design, which will in turn contribute towards the effectiveness and usability of the synthesized web-based support model. We anticipate that this model will complement ordinary health care, and increase the quality, accessibility, participation, and feeling of control for patients and their relatives and friends. Our intention is that the fully developed model should be dynamic enough to be used in different conditions, contexts, and settings. The multiple case method makes it possible to use different case experiences and environments, while also offering the opportunity to go beyond these. Therefore, data collection includes various techniques such as focus groups, films, web-based surveys, and qualitative interviews with prospective users. Data is also gathered to identify the techniques used in the design of the web-based support, and how and to what degree they are used. In addition, data will include the theoretical concepts used in the different cases, how these concepts are used and applied, and the associated technical support available for the web-based technology in each case. Within-case analyses and across-case analyses will be performed on different levels[23, 24]. The processing will also focus on social support, meaning-, practice-, community-, and identity-focused learning, and take into consideration variations of the studied phenomena. Finally, data concerning level of person-centredness will be assessed and analysed using statistical methods and qualitative methods at the meta-level. This will be followed by evaluations of the usefulness of the web-based support using standard web-based instruments for measuring usability that have been redesigned to focus on person-centred issues. The outcome variables are the usability for different users to achieve their specified goals, and the effectiveness, efficiency, and user satisfaction in particular contexts of use. The analyses will also include generative knowledge about variations between cases in relation to the design of a person-centred web-based support for long-term illness. Diffusion is partly built into the research approach through the multiple case study design, with a multiplicity of experiences rendering possible a meta-synthesis for the construction of a conceptual model of web-based support for patients with long-term illness. However, there will also be an analysis of the different measures of diffusion activities in the various cases. In this paper we outline a research project with implications for persons suffering from long-term illness and for their significant others. There is a gap in the scientific knowledge of how to ensure that person-centred processes are transferred through web-based interactions. We argue that our multi-case approach will encourage a scientific renewal, bringing together different contexts of care, expanding our understanding, and potentially enabling patients and significant others to benefit from making more knowledge-based decisions. The project we describe focuses on four main aspects of the development of person-centred web support: (1) the use of people’s experiences, (2) the role of theories, (3) the evaluation of the effects, and (4) the development of a person-centred model. Our aim to contribute to the emerging field of PCC motivates the focus on these aspects. The conceptual sources that form our theoretical basis – social theory of learning, social support, and the ecological model of systems theory – offer various ways to understand the phenomenon of web-based support on different levels and the relationships between those levels. At the same time they guide our understanding of the core activities involved in the use of the Internet to manage long-term illness. In our project continuing activities include an in-depth analysis of the use of people’s experiences in the development of web-based supports. In this next step we will problematize the use of people’s experiences when developing web-based support for long-term illness. We will pursue this in the light of participatory design principles, and the main questions will consider how people’s experiences are materialized in the development of person-centred web support and how their experiences should be materialized. However, although earlier work is characterized by the intention to use PD to capture patients’ needs, few studies analyse the development process and design results in relation to the emerging ideas of person-centred care. More specifically we will focus on issues such as the use of particular question areas and methods applied to capture people’s experiences. This involves an endeavour to understand what types of experiences are actually being captured in the process of developing a web-based support (e.g. personal experiences of patients, experiences from clinical work) and what this means in relation to PCC. For the University of Gothenburg Centre for Person-Centred Care (GPCC). This work was supported by Centre for Person-Centred Care at University of Gothenburg (GPCC), Sweden. GPCC is funded by the Swedish Government’s grant for Strategic Research Areas, Care Sciences [Application to Swedish Research Council nr 2009–1088] and co-funded by University of Gothenburg, Sweden. IS, MB, A-LH, AR, MJN, CS-L, IK were responsible for identifying the underlying structure of the research project. UJ drafted this manuscript and IS made the final version, which was reviewed by all authors. All authors read and approved the final manuscript.